Athens (; Modern Greek: Αθήνα, Athína [aˈθina], Ancient Greek: Ἀθῆναι, Athênai, Athínai) is the capital and largest city of Greece. Athens dominates the Attica region and is one of the world's oldest cities, with its recorded history spanning over 3,400 years, and its earliest human presence starting somewhere between the 11th and 7th millennium BC. Athens is home to two UNESCO World Heritage Sites, the Acropolis of Athens and the medieval Daphni Monastery. Landmarks of the modern era, dating back to the establishment of Athens as the capital of the independent Greek state in 1834, include the Hellenic Parliament and the so-called "architectural trilogy of Athens", consisting of the National Library of Greece, the National and Kapodistrian University of Athens and the Academy of Athens. Athens is also home to several museums and cultural institutions, such as the National Archeological Museum, featuring the world's largest collection of ancient Greek antiquities, the Acropolis Museum, the Museum of Cycladic Art, the Benaki Museum and the Byzantine and Christian Museum. Athens was the host city of the first modern-day Olympic Games in 1896, and 108 years later it welcomed home the 2004 Summer Olympics. In Ancient Greek, the name of the city was Ἀθῆναι (Athēnai, pronounced [a.tʰɛ̂ː.nai̯] in Classical Attic) a plural. In earlier Greek, such as Homeric Greek, the name had been current in the singular form though, as Ἀθήνη (Athēnē). It was possibly rendered in the plural later on, like those of Θῆβαι (Thêbai) and Μυκῆναι (Μukênai). The root of the word is perhaps not of Greek or Indo-European origin, and is a possible remnant of the Pre-Greek substrate of Attica, as could be the name of the goddess Athena (Attic Ἀθηνᾶ, Athēnā, Ionic Ἀθήνη, Athēnē, and Doric Ἀθάνα, Athānā), that was always related to the city of Athens. During the medieval period the name of the city was rendered once again in the singular as Ἀθήνα. However, after the establishment of the modern Greek state, and partly due to the conservatism of the written language, Ἀθῆναι [aˈθine] became again the official name of the city and remained so until the abandonment of Katharevousa in the 1970s, when Ἀθήνα, Athína, became the official name. An etiological myth explaining how Athens has acquired its name was well known among ancient Athenians and even became the theme of the sculpture on the West pediment of the Parthenon. The goddess of wisdom, Athena, and the god of the seas, Poseidon had many disagreements and battles between themselves, and one of these was a race to be the Patron God of the city. In an attempt to compel the people, Poseidon created a salt water spring by striking the ground with his trident, symbolizing naval power. However, when Athena created the olive tree, symbolizing peace and prosperity, the Athenians, under their ruler Cecrops, accepted the olive tree and named the city after Athena. The oldest known human presence in Athens is the Cave of Schist, which has been dated to between the 11th and 7th millennia BC. Athens has been continuously inhabited for at least 7000 years. By 1400 BC the settlement had become an important centre of the Mycenaean civilization and the Acropolis was the site of a major Mycenaean fortress, whose remains can be recognised from sections of the characteristic Cyclopean walls. Unlike other Mycenaean centers, such as Mycenae and Pylos, it is not known whether Athens suffered destruction in about 1200 BC, an event often attributed to a Dorian invasion, and the Athenians always maintained that they were "pure" Ionians with no Dorian element. However, Athens, like many other Bronze Age settlements, went into economic decline for around 150 years afterwards. Athens has a hot-summer Mediterranean climate (Köppen Csa). The dominant feature of Athens's climate is alternation between prolonged hot and dry summers and mild to cool winters with moderate rainfall. With an average of 419.1 millimetres (16.50 in) of yearly precipitation, rainfall occurs largely between the months of October and April. July and August are the driest months, where thunderstorms occur sparsely once or twice a month. The annual precipitation of Athens is typically lower than in other parts of Greece, mainly in western Greece. As an example, Ioannina receives around 1,300 mm (51 in) per year, and Agrinio around 800 mm (31 in) per year. Daily average highs for July (1987–2016) have been measured at 34.5 °C (94 °F), but some parts of the city may be even warmer, in particular its western areas partly because of industrialization and partly because of a number of natural factors, knowledge of which has been available from the mid-19th century. Athens incorporates architectural styles ranging from Greco-Roman and Neoclassical to modern times. They are often to be found in the same areas, as Athens is not marked by a uniformity of architectural style. 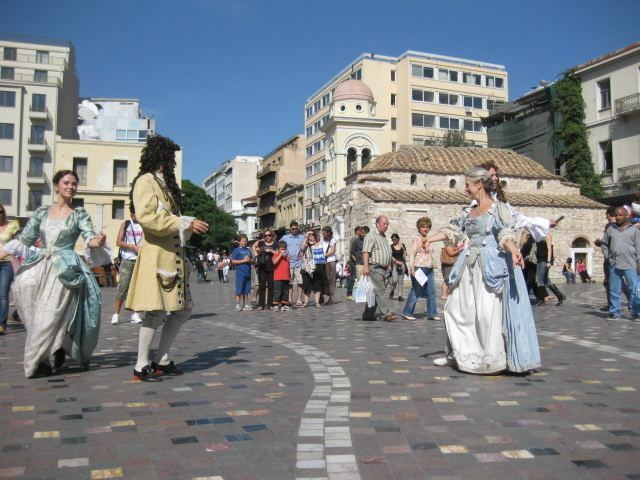 The municipality of Athens, the city centre of the Athens Urban Area, is divided into several districts: Omonoia, Syntagma, Exarcheia, Agios Nikolaos, Neapolis, Lykavittos, Lofos Strefi, Lofos Finopoulou, Lofos Filopappou, Pedion Areos, Metaxourgeio, Aghios Kostantinos, Larissa Station, Kerameikos, Psiri, Monastiraki, Gazi, Thission, Kapnikarea, Aghia Irini, Aerides, Anafiotika, Plaka, Acropolis, Pnyka, Makrygianni, Lofos Ardittou, Zappeion, Aghios Spyridon, Pangration, Kolonaki, Dexameni, Evaggelismos, Gouva, Aghios Ioannis, Neos Kosmos, Koukaki, Kynosargous, Fix, Ano Petralona, Kato Petralona, Rouf, Votanikos, Profitis Daniil, Akadimia Platonos, Kolonos, Kolokynthou, Attikis Square, Lofos Skouze, Sepolia, Kypseli, Aghios Meletios, Nea Kypseli, Gyzi, Polygono, Ampelokipoi, Panormou-Gerokomeio, Pentagono, Ellinorosson, Nea Filothei, Ano Kypseli, Tourkovounia-Lofos Patatsou, Lofos Elikonos, Koliatsou, Thymarakia, Kato Patisia, Treis Gefyres, Aghios Eleftherios, Ano Patisia, Kypriadou, Menidi, Prompona, Aghios Panteleimonas, Pangrati, Goudi and Ilisia. Metaxourgeio (Greek: Μεταξουργείο) is a neighborhood of Athens. The neighborhood is located north of the historical centre of Athens, between Kolonos to the east and Kerameikos to the west, and north of Gazi. Metaxourgeio is frequently described as a transition neighborhood. After a long period of abandonment in the late 20th century, the area is acquiring a reputation as an artistic and fashionable neighborhood following the opening of art galleries, museums, restaurants and cafés. Local efforts to beautify and invigorate the neighborhood have reinforced a sense of community and artistic expression. Anonymous art pieces containing quotes and statements in both English and Ancient Greek have sprung up throughout the neighborhood, bearing statements such as "Art for art's sake" (Τέχνη τέχνης χάριν). Guerilla gardening has also helped to beautify the area. Many of the southern suburbs (such as Alimos, Palaio Faliro, Elliniko, Voula, Vouliagmeni and Varkiza) host a number of sandy beaches, most of which are operated by the Greek National Tourism Organisation and require an entrance fee. Casinos operate on both Mount Parnitha, some 25 km (16 mi) from downtown Athens (accessible by car or cable car), and the nearby town of Loutraki (accessible by car via the Athens – Corinth National Highway, or the suburban rail service Proastiakos). Mycenean Athens in 1600–1100 BC could have reached the size of Tiryns; that would put the population at the range of 10,000 – 15,000. 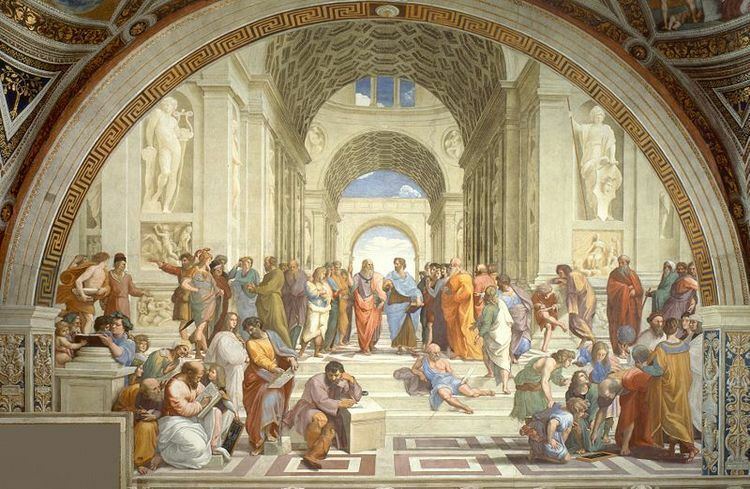 During the Greek Dark Ages the population of Athens was around 4,000 people. In 700 BC the population grew to 10,000. In 500 BC the area probably contained 200,000 people. During the classical period the city's population is estimated from 150,000 – 350,000 and up to 610,000 according to Thucydides. When Demetrius of Phalerum conducted a population census in 317 BC the population was 21,000 free citizens, plus 10,000 resident aliens and 400,000 slaves. This suggests a total population of 431,000. Besides being served by a fleet of natural-gas and diesel buses, the Athens Urban Area is also served by trolleybuses – or electric buses, as they are referred to in the name of the operating company. The network is operated by Electric Buses of the Athens and Piraeus Region, or ILPAP (Greek: ΗΛΠΑΠ) and consists of 22 lines with an operating staff of 1,137. All of the 366 trolleybuses are equipped to enable them to run on diesel in case of power failure. The 2011 Special Olympics World Summer Games was in Athens. The opening ceremony of the games took place on 25 June 2011 at the Panathinaiko Stadium and the closing ceremony was held on 4 July 2011. Over 7,500 athletes, from 185 countries, competed in a total of 22 sports.